(although it has to be said stocks are moving fast). The Amazon Paperwhite has an enhanced lighting system that allows you can use it in any lighting conditions but still has the legendary battery life of the other pre Kindle fire. 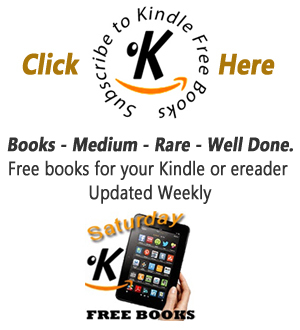 kindle models. 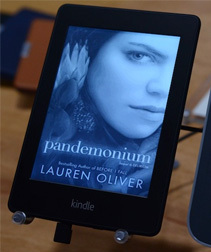 Paper white is the latest screen technology from Amazon to the new model. Even in bright sunlight, Paperwhite delivers clear, crisp text and images with no glare. It also has it's own screen back light that means you can read the easy reading book like screen in any lighting levels for the first time. By default this also means you can read your kindle in bed without bugging any one else who also happens to be there! One of the best features of the kindles is the ability to change the font size or typeface of your reading material to your taste, and the new Paperwhite is no exception offering the reader six clear fonts in serif or non serif types in seven different sizes. The new Kindle has gone for a very simple and ergonomic design, just black, with a rubberish back plate. It just has one real physical button which will be familiar to iPad owners and contemporary tablet users. But the intersting thing is the way it is only an ereader device and nothing else. It's more like a slim cheese grater than an iPad. The Paperwhite's design purpose is to make you ignore it! You can swipe across the Paperwhite screen to turn pages, like other tablets but you can just use the lightest tap to do the same thing. Tap a thin strip of screen down the left hand side and you will go back one page, or tap along the top of the screen and the menu will be shown. Battery life on the new Kindle paperwhite according to Amazon is up to eight weeks. The battery life of the older Kindle models could certainly last 6 weeks with careful use and although I haven't tried this myself I see no reason to doubt Amazon on this one. 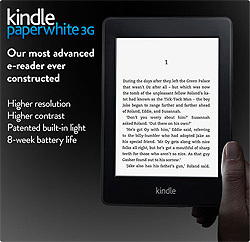 The Wifi Kindle Paperwhite model kicks in at £109 and the Kindle Paperwhite 3G is priced at £169 currently. The extra dosh paid for the 3G gives you a really good bonus with Free 3G wireless. This means you will not have to go hunting or paying for Wi-Fi hotspots and there are no annual contracts or monthly fees. 3G wireless works globally so you can download books anytime, anywhere. However the Wifi model is great if you plan to use it mainly at home or with an always on wifi signal. In conclusion the Kindle Paperwhite is Light weight with a long battery life and is probably the best way for reading novels and literature on the move. The illuminated screen means you can read comfortably in bed and books download quickly. The 3G model has the advantage of being able to download books and documents for free almost anywhere.